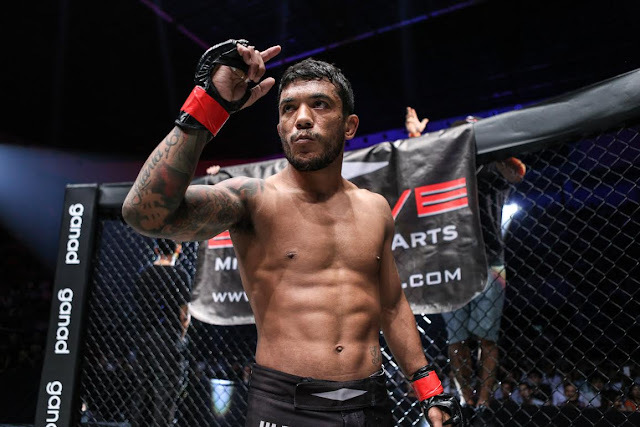 Even though Roy Doliguez seems to have the upper hand in the striking department, Brazilian combatant Alex “Little Rock” Silva has no qualms when it comes to trading kicks and punches with the Filipino fighter. Silva is slated to face Doliguez on the undercard of ONE: THRONE OF TIGERS, which takes place at the 12,000-capacity Stadium Negara in Kuala Lumpur, Malaysia on 10 February. Despite coming into the scheduled three-round strawweight encounter as the heavy favorite, many cageside observers believe that a tough test awaits Silva in the stand-up exchanges due to his opponent’s boxing background. Doliguez is a former professional boxer, who has nearly 50 fights under his belt. He captured the WBO Asia Pacific light flyweight title in September 2002. “I know he has a good striking game because he is a boxer. He is also explosive and strong,” Silva said of Doliguez. Silva, who represents Evolve MMA in all of his bouts under the ONE Championship banner, asserted that he has a fair share of knowledge in terms of delivering blows from a toe-to-toe stance. “I am very well prepared in any situation of the fight because everyday I train and spar with the legends and world champions of Muay Thai at Evolve MMA. Roy Doliguez is a good striker, but I know I can match his skills in striking,” he stated. Silva is known to be a world-class Brazilian Jiu-Jitsu practitioner with a terrifying ground game and a knack for securing highlight-reel submission finishes. Four of his professional career wins came by way of submission. The 34-year-old native of Sao Paulo, Brazil stressed that he is more than willing to stand and bang with Doliguez, but he stressed that his grappling pedigree will remain as his primary arsenal in the marquee match-up. “I believe in my skills as I have trained hard in all aspect for the fight. But for sure, my Brazilian Jiu-Jitsu background is something special because I have been training that discipline for my whole life. Whoever I face in a fight, my grappling skills are my strong element,” he ended. ​​​​For more updates on ONE Championship, please visit www.onefc.com, follow us on Twitter and Instagram @ONEChampionship, and like us on Facebook at https://www.facebook.com/ONEChampionship.